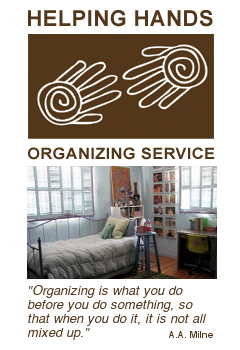 Just as your own life would improve if you were more organized, so would your child’s. It’s about so much more than labeled bins for toys and chore charts with stars. Organizing their rooms – that is the simplest part! That is necessary of course, but not sufficient. We need to take it further. Our children need to learn new habits of organization. They won’t necessarily learn them by themselves, and they won’t learn them by having us nagging at them and scolding them. I will work with you and/or your child or teenager to make their room work on a physical level. Then, I teach you and your child new systems that keep the organization in place. At the same time, I train you to train your child – staying positive, firm and consistent. It really is possible! when your kids aren’t organized? Please get organized – for your children’s sake. Please train your children to be organized – to maximize their chances of success at home and school now, at work and in the world later. Certified Practitioner – Calmer, Easier, Happier Parenting and Teaching program.